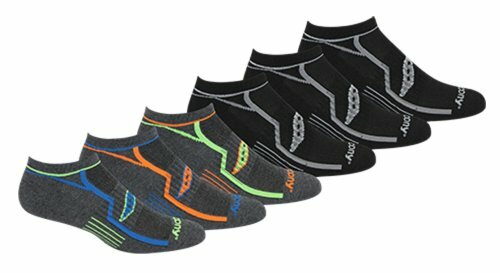 Which cycling socks do I need? 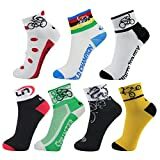 Cycling socks are a much-understated cycling accessory which can help improve the cyclist’s performance in addition to contributing to maintaining the health of the feet. Cycling socks provide a layer of protection for the skin and the feet as a whole, reducing the chance of rubbing and of abrasions. Some types of cycling socks offer padding in the target areas where abrasions or blistering may occur. Furthermore, cycling socks may provide stretch and support and ensure that your feet stay in place while inside your cycling shoes, eliminating the chance of slipping and increasing performance levels. Additional features may include breathable materials and materials which soak-up the moisture, ensuring that your feet remain fresh, dry, and healthy at all times. We have reviewed ten of the best cycling socks which are currently on the market, helping you to decide which cycling socks are the best choice for you and your needs. The Thirty48 Low Cut Cycling Socks for Men and Women provides unisex cycling socks which will ensure that your feet remain dry and fresh. Supporting your feet as you move, features of the cycling sock include elastic arch support and materials consisting of 68% polypropylene, 27% nylon, and 5% lycra. The plantar arch of your foot is therefore supported with the amount of friction reduced greatly, allowing the flat toe seam box and padding across the heel and the metatarsal to protect your feet from the threat of blisters and other abrasive conditions. 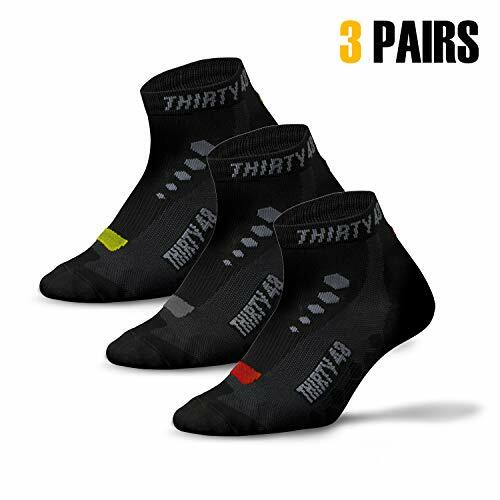 In addition, moisture wicking technology ensures that the Thirty48 cycling socks are produced with CatalystAF technology, increasing the potential airflow across the stitching and ensuring that comfort and coolness are paramount. The Thirty48 Low Cut Cycling Socks for Men and Women are available in four different sizes; Small for sizes Women 5 – 8 and Men 4- 7, Medium for sizes Women 7 – 10 and Men 6 – 9, Large for sizes Women 9 – 12 and Men 8 – 11, and finally Extra Large for sizes Men 10 – 14. Furthermore, there are eight different color choices and color combinations in which to choose from. Why We Liked It – The Thirty48 Low Cut Cycling Socks for Men and Women provides a fantastic cycling sock in numerous sizes and color choices, for both men and women. The elastic arch support, padding around vulnerable abrasion areas, and unique CatalystAF technology ensure that this is a high-performance cycling sock for the most dedicated cyclist. The Lin 7 Pack Sports Bike Running Spin Class cycling socks are made from polyester, nylon, and spandex, providing a supportive stretch and a comforting composition. Being available in a Medium size, fitting shoe sizes 9 – 11, in addition to Large size, fitting shoe sizes 10 – 13, these cycling socks contain a mesh vent structure which provides relaxing ventilation and ensures that your feet can breathe. Three eye-catching color design are available, from a striking black and white dragon design to a white, black and red LiN symbol, to a striped design featuring a picture of a bicycle. Friction is eliminated with the invisible toe seam, while the contoured heel offers stability and ensures that the socks remain in position. Furthermore, the Coolmax fabric soaks up moisture and ensures that your feet are always dry and fresh. Why We Liked It – The Lin 7 Pack Sports Bike Running Spin Class cycling socks feature Coolmax fabric across the footbed, ensuring that any sweat and moisture is soaked-up and that feet remain clean, dry, and fresh. Don’t have access to a spin class? Try it from home with one of these exercise bikes! The Compressprint Men and Women Cycling Socks provide 15 – 20 mm Hg for better blood circulation for the calf, providing protection for the legs and stimulating blood flow. 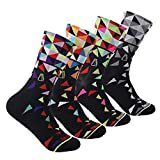 These socks come in a pack of four pairs, being available in darker base color with a colorful pattern or in a bright selection of base colors with the same great patterned design. In addition, the Compressprint cycling socks are made from high elastic yarn consisting of 100% nylon and spandex, providing features such as antiseptic and anti-odorization. The standard medium size is suitable for individuals weighing up to 220 lbs, and the product comes complete with a 30-day money back guarantee. Why We Liked It – The Compressprint Men and Women Cycling Socks feature the capability to increase blood circulation and stimulate the blood throughout the leg, adding a fantastic health benefit. The Copper Compression Socks are unisex socks available in small to extra large and are available in either black or beige color choices. Features include anti-fatigue capabilities, soothing tired and achy legs and feet, providing the ability to enhance your cycling performance. The socks utilize graduated compression, offering maximum compression at the ankle which graduates in compression levels up the leg. In addition, the socks reach the knee to provide the best level of support, reducing swelling, controlling odors and boosting blood circulation, providing an all-round massage for your legs. Why We Liked It – The Copper Compression Socks provides some great features for individuals concerned with blood circulation, or for sufferers of varicose veins, providing graduated compression and increasing blood flow. The Swiftwick VISION FIVE Socks are literally built for cycling, being available in black, blue, green, or red color choices and are available in either small, medium, or large sizes. Features include high-performance fibers to soak up the moisture and dry your feet quickly, whatever the event and whatever the weather. Furthermore, the contoured compression fit supports every contour of your feet, reducing and eliminating blisters and swelling. 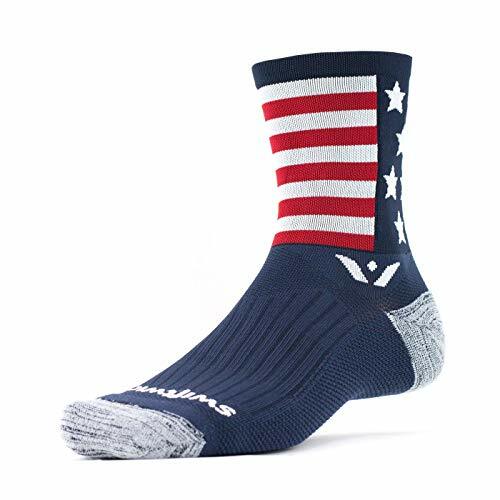 In addition, the Swiftwick VISION FIVE cycling socks provide built-in channels to keep your feet cool and to enable them to breathe, and a percentage of each sale is donated to charitable initiatives. Why We Liked It – The Swiftwick- VISION FIVE Socks look great and feature the desired components of a good, solid cycling sock. However, the fact that Swiftwick donates a percentage of their sales to charitable initiatives is a positive benefit which contributes to the community. The Yijiujiuer Men’s Cycling Socks are available in Men’s US sizes 6.5 – 11.5, providing three stylish color choices and designs in every pack. Features include increasing circulation throughout the calf, preventing potential injuries within the muscles. These cycling socks look great and keep you feeling cool and fresh, offering a flexible fit across your foot due to the nylon and spandex material composition. Why We Liked It – The Yijiujiuer Men’s Cycling Socks Sports are available in individual sizes, as opposed to the standard small to large sizings. This ensures that you receive a perfect fit every time, increasing your cycling performance and providing the best support levels and comfort. The Saucony Men’s Multi-Pack Performance cycling socks are available in black, grey and white assortment packs, being available in either a pack of six, twelve or eighteen. Providing one sizing option of shoe sizes 8 – 12, these cycling socks offer a pull-on closure, in addition, to run dry moisture management and enable superior absorption of moisture and sweat to ensure that your feet are fresh and dry, feeling cool at all times. Featuring mesh ventilation, maximum airflow is achieved, in addition to targeted arch compression to provide the perfect amount of compression to your arch. Furthermore, a cushioned sole enables the best protection from impact and shock, while ensuring that your feet are supported at all times. Why We Liked It – The Saucony Men’s Multi-Pack Performance cycling socks come in a range of multi-pack choices, providing value for money in addition to great performing cycling socks. 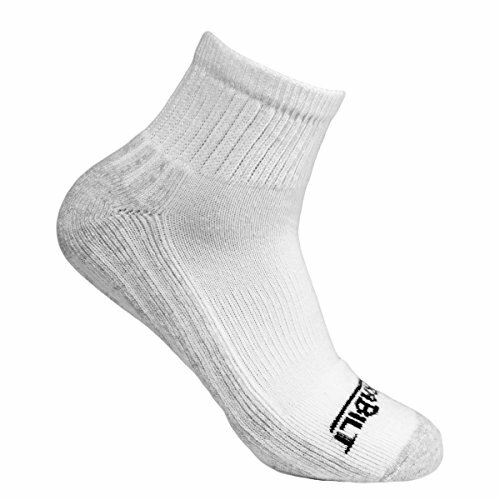 The DURABILT Adult White Cotton Ankle Comfort sock looks like the average white sport sock, when in fact these socks additionally provide comfort and support throughout your cycle, or through any other form of exercise. Being made from 84 % cotton, 7 % nylon, 4 % elastic, 3 % lycra, and 2 % polyester, the DURABILT brand ensures that comfort and quality are paramount. Furthermore, arch support is included to embrace your feet, adding durability in addition to padded heels. These socks are available in a pack of three pairs and are available in US sizes 9 – 10. Why We Liked It – The DURABILT Adult White Cotton Ankle Comfort socks possess added functions and features while appearing as though they were the average white sports socks. 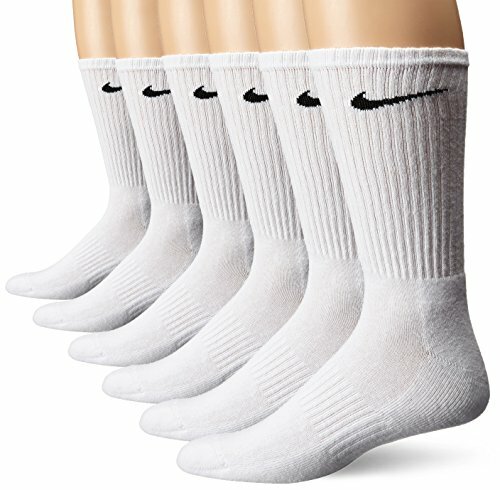 The NIKE Performance Cushion Crew Socks are available in a pack of six pairs, in either a black or white color choice with a contrasting NIKE logo. These socks are available in sizes small women’s, which encompasses sizes 4 – 6, through to extra large, or a men’s size 12 – 15, possessing a reinforced heel and toe area in order to enhance durability throughout high-usage areas. The design of the socks features rib cuffs, ensuring a comfortable and snug fit in addition to arch support in order to offer a secure fit. Why We Liked It – The NIKE Performance Cushion Crew Socks with Band offer high-performance socks from a brand which you can trust. These socks look great and feel great. The Enerwear 10P Pack Men’s Cotton Moisture Wicking socks are available in sizes 6 through to 12, ensuring that there is a size to fit everybody. 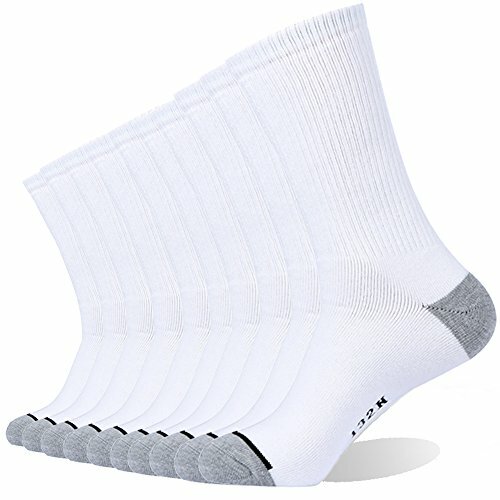 Being available in either a pack of white socks, a pack of black socks, or a multi-color pack, these socks are sold in packs of ten pairs, providing fantastic value for money. 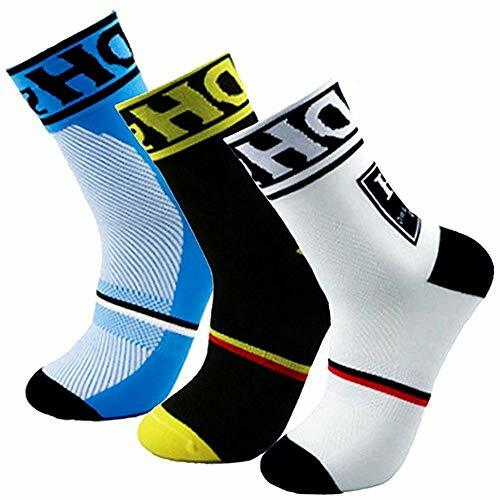 The material composition consists of 80 % cotton, 15 % polyester, 3 % nylon, and 2 % spandex, the socks are made from 132 needle, which is a great increase on the standard brands of similar socks. The heavy cushion beneath the socks ensures that comfort is paramount and that your feet are consistently relaxed and feel cool and fresh. Furthermore, the reinforced heel and toe ensure an increased level of durability, offering a ribbed leg for additional support as well as stitch by stitch toe closing. Why We Liked It – The Enerwear 10P Pack Men’s Cotton Moisture Wicking socks are available in a great range of color options and different sizings, proving that there really is something for everyone. The reinforced heel and toe areas are great features to support the feet precisely, while the heavy cushion beneath the sole ensures that your feet feel relaxed and that any shock is absorbed. If you are new to cycling, then you may choose to wear standard socks for your first cycle. However, a better option for you may be to invest in a pair of cycling socks, adding additional comfort and support for your feet. In today’s cycling sock market, you can buy almost any color and design of cycling socks. This is great, although color and design should not be the deciding factor when choosing your cycling socks. Comfort is the most important feature and so trying on a wide range of cycling socks is the recommended approach to adopt. 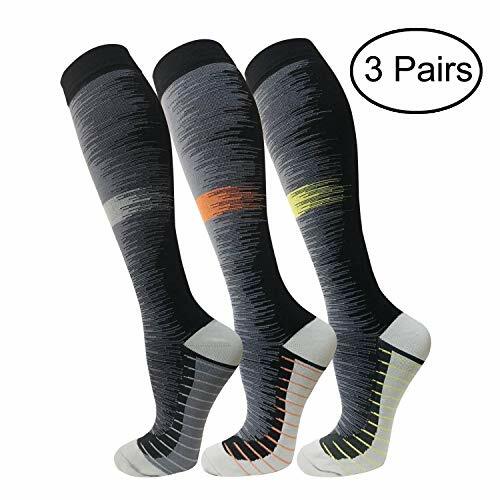 You can purchase ankle socks or knee-high socks, whichever you prefer, with built-in arch support and reinforced toe and heel areas in order to support your feet appropriately. Some cycling socks may feature padding on the base of the sock to absorb shock or may provide extra support in areas of the feet which are susceptible to abrasions and blisters. A: To find which cycling socks will suit you the most, you will have to try a wide range first. This may not always be possible, depending upon the policy of the store you visit, or whether you are purchasing online, so the best course of action may be to search the sales and buy a wide range of cycling socks for very little cost. You may not find the best or most desirable colors, but you may find out what length and features of the socks which you prefer.